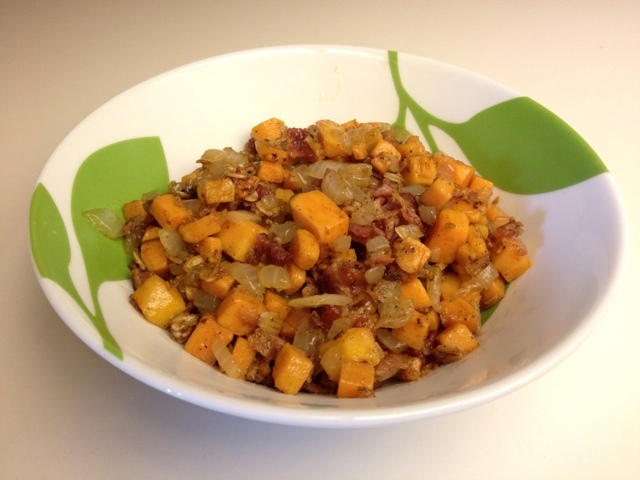 When all bacon is cooked, increase stockpot to medium-high and add sweet potatoes, onion, and spices. Stir to coat, then cook until onions are browning and sweet potatoes are tender, about ten minutes, stirring regularly. While the potatoes and onions cook, cut the bacon into small chunks. When the potatoes are tender, reduce heat to medium, then stir in the granola and bacon. Cook one minute, then serve while hot.